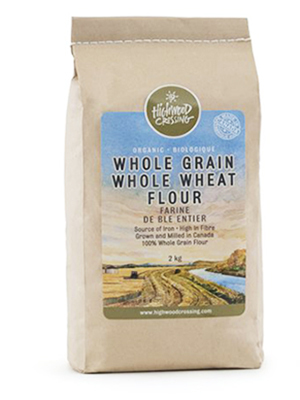 Our Organic 100% Whole Grain Whole Wheat Flour contains all the nutritional goodness found in the whole grain kernel as nothing is removed during the milling process. This includes the vitamin-E rich wheat germ, the outer mineral rich bran layers and the endosperm. 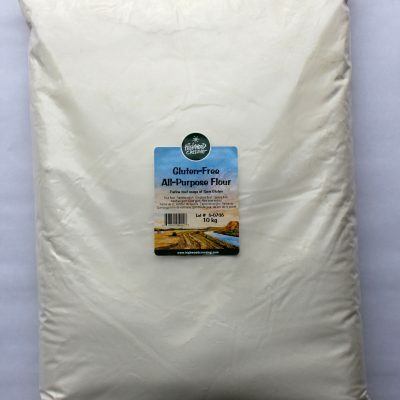 Neither are any additives or preservatives, vitamins, bleaching, maturing or dough conditioning agents added as is commonly done in larger commercial flour mills. 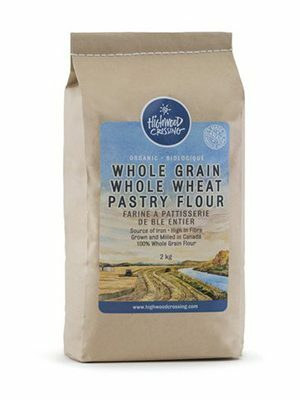 Highwood Crossing Whole Wheat Flour is certified organic and non-GMO and is a source of iron and a high source of fibre. Milled in a nut and peanut free environment. 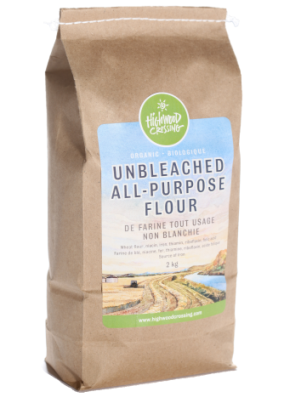 Our Organic Whole Wheat Flour is ground from heritage varieties of grown in Western Canada, Hard Red Spring wheat and has a gluten content of between 12.5% & 13.5 %. The higher gluten content provides excellent support for the light honey-comb structure of yeast breads. In a large bowl add sugar to warm water and then add yeast. Let sit for 10 minutes until frothy. Mix egg, oil, and lemon juice together in a separate bowl, and then add to yeast mixture. Add the salt and then gradually add the flour until mostly incorporated. Put the dough mixture onto the counter, scrape out bowl and knead dough for about 8 minutes. You may need to add a little more flour to keep dough from sticking to the counter. Once the dough has been kneaded and has come together in a round ball, put back into the large bowl used for mixing (scraped out) and add a tablespoon of oil to the bottom. Place the dough on the oil and roll it around to cover all sides. Cover the bowl and let rise until doubled, about 1 hour. You could also place the dough into an oiled clear plastic container to rise – very easy to see when it has doubled! Deflate dough by pressing your fist into the puffed up mass, then shape to standard loaf by tucking under the edge and rolling the dough into a loaf shape. Place in greased 9×5 loaf pan for the second rise. Proof shaped dough in warm, draft-free place for about an hour or until double by placing pan into a large clear plastic bag. Bake at 350ºF for 30-45 minutes or when golden and sounds hollow when tapped on the loaf bottom.